VanEck has partnered with Lonsec Investment Solutions Pty Ltd (Lonsec) to provide three low-cost model portfolios comprised entirely of exchange traded funds (ETFs). The model portfolios are designed to assist advisers and brokers to construct simple and diversified portfolios to help meet their clients’ investment objectives. VanEck ETF Model Portfolios are powered by Lonsec drawing on their established research and portfolio construction expertise to provide recommended strategic asset allocations tailored to three risk/return profiles: Balanced, Growth and High Growth. Lonsec employs a disciplined and proven portfolio construction process that leverages their strategic asset allocation framework. All ETFs included in the models must have a minimum ‘Lonsec Recommended rating’ and the model portfolio may include ETFs not issued by VanEck. Lonsec will be performing ongoing independent oversight of the models and will be providing quarterly performance reporting. Each model portfolio provides broad market exposure across asset classes including Australian equities, global equities, property, Australian fixed income and international fixed income. 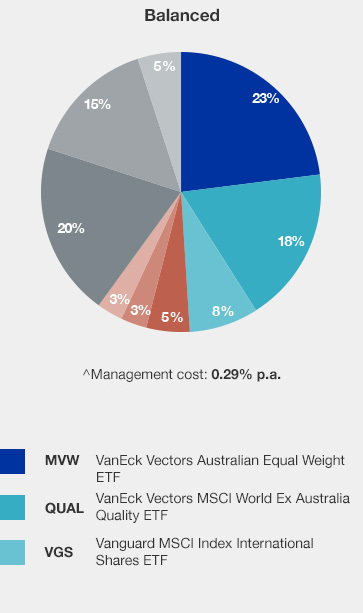 Utilising simple low-cost ETF strategies delivers diversified exposure for considerably less cost than the average cost of Australian managed funds. Asset allocation is a critical element of any investment strategy. It forms the basis of a prudent investment policy and drives the bulk of an investor’s risk and return outcome. VanEck and Lonsec believe that a diversified approach to portfolio construction is critical to achieving investment objectives. Each model portfolio is split between growth and defensive assets across a range of ETFs that Lonsec considers provide an appropriate exposure to the relevant asset class. ^Management costs are estimates as of 31 March 2017 calculated as a weighted average of the management costs disclosed in the PDSs for the underlying ETFs in the model portfolio. 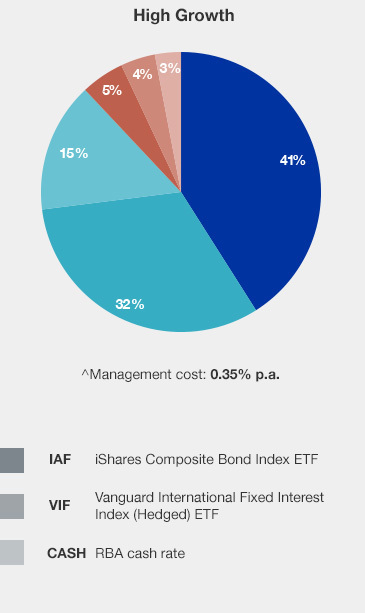 *Performance returns are calculated using actual returns of the ETFs in the model portfolio, net of management fees and costs and assuming reinvestment of any distributions. Performance does not include brokerage costs of investing in the ETFs on ASX. Performance since inception return was calculated from 30 November 2014. Due to short trading history: allocation to IFRA prior to April 2016 uses to DJRE; allocation to VIF prior to December 2015 uses Vanguard International Fixed Interest Fund. Past performance is not indicative of future performance.